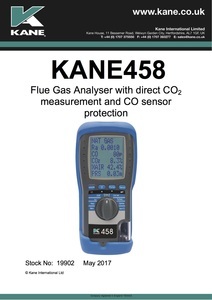 Transfer analyser readings to your PC using a KANE LIVE software. Send printout data to your mobile device using the free Kane printer app. As KIT plus GLD/450plus gas leak detector, KAL1 air liquid temperature probe, pressure hose & 2 x KPCP clamp-on pipe temperature probes and carry bag. KANE IRP-2, KANE700 gas leak detector, KANE-NCV3 non-contact voltage tester, pressure hose, charger and backpack.